Add ginger and garlic to mixer bowl. Chop for 3 sec/speed 9/MC on. Scrape bowl down. Add roasted chilli sauce, stock concentrate, lime juice and liquid stevia to bowl. Combine for 5 sec/speed 3/MC on. Add sliced chicken to mixer bowl, combine for 5 sec/speed 1/reverse/MC on. Remove chicken to steaming tray. Without washing bowl, add 300 g or 10.6 oz water and put steaming tray in place. Steam for 7 min/steaming temperature/speed 2. Add broccoli to steaming tray and combine well with chicken. Steam for 10 min/steaming temperature/speed 2. 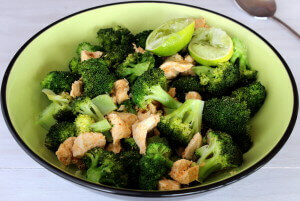 Serve immediately with fresh lime juice and extra salt if desired. This recipe serves 4 on HCG Protocol. This has heaps of flavor and is so easy. I made it into a “stir-fry” by adding a red capsicum, green beans and noodles in with the broccoli and doubled the chicken. Family gobbled it up and fought over the leftovers. It is going on a regular rotation here. I have just made this with Baby Octopus……talk about amazing….. I have a fridge full of octopus so thanks for the hot tip!! love the recipe but wish it would have specified which steaming component on the tray. i put it on the top tray and realised after the first 7 minutes that pretty much done nothing to the chicken cooking wise. my rookie mistake maybe.. only just starting to do more with veroma. none the less once i got it right… great meal!!! I have just started another round of HCG .. Oh my goodness! How good is this dish? Freakibg amazing! I subbed zuccini in to make up the veg component .. Delish! Once again, your recipes amaze those I use them on, I mean with, I mean…well you know what I mean. Nik, you know how fussy my family is, and so its not often I can cook even your recipes for them. I now have a Canadian boarder who is of Korean decent. She loves her chilli and just loves food in general. I’ve been cooking your recipes for her so I can enjoy them too and she just loves them. She told me I’m a good cook and anything I make is yummy. I can thank you for that. I don’t hear that from the fussy hubby and kids very often, but its nice to know that someone with real taste thinks that, and all because of your awesome recipes. 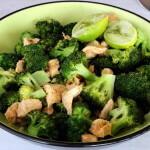 We have the Chilli Lime Chicken tonight with plenty of garlic and chilli as hubby is away for 2 weeks! Everything garlic in my house this fortnight! Next, Malaysian Satay! Is there an alternative to the liquid stevia? I.e agave syrup? You can leave it out or add any sweetener. For example, I dolloped some honey in tonight. Maybe about a tablespoon, but I’m not sure. It was a very heaped teaspoon or 2. I then found this recipe, wow so easy tasty and even my partner loves it. Even more delicious than I expected. Thanks!!! Thank you thank you thank you!!! I’m on HCG and these was delicious. I don’t have liquid Stevia so I just left it out. It was awesome!!!!! I always love this but tonight I did it with 2 salmon fillets (cut up in chunks) and added ginger too since I’m under the weather. So good! Thanks Nik. Another quick easy and absolutely delicious meal! Such a delicious quick and easy recipe! I was rushing between events, as well as arranging lunch for a group of people between events, but dropped in at home to make this. So quick and easy! I did the first part then popped it in the fridge. Once I’d arranged and delivered lunch, I popped home and did the cooking part of this while I loaded my car with the ingredients I was needing to serve dessert for the event that I was on my way to set up. In other words, this is so darn easy that you can do it in a rush and not feel overwhelmed. And, its very nice, even with out the garlic! Delicious!! A weekly fave in our house – my 10 month old LOVES it (sans chilli). I’ve also made it was beef and it is equally as yummy 🙂 Thanks Nik!! For those not doing HCG Protocol what is the option for liquid stevia. I’m not a fan of these so can I use raw sugar, rapadura, rice malt syrup etc etc?? I too would like to know what can be substituted for the Stevia, if not doing HCG? Hi all, Just use honey or maple or sugar – anything really! Made this diet, really nice, a lot tastier than expected. Looking forward to the leftovers tomorrow thanks for another great recipe. Yum, yum, yum! I think next time I will cut the broccoli a bit smaller than I did this time, or else cook it for longer. I added a small piece of turmeric to the chilli and garlic (just because it’s supposed to be so good for you). It was an absolutely delicious dinner! Nikki, you are a genius! Loved this one. So easy to make and full of flavor. Can see this being a regular dinner on P2 and probably beyond.